Thank you for the link! 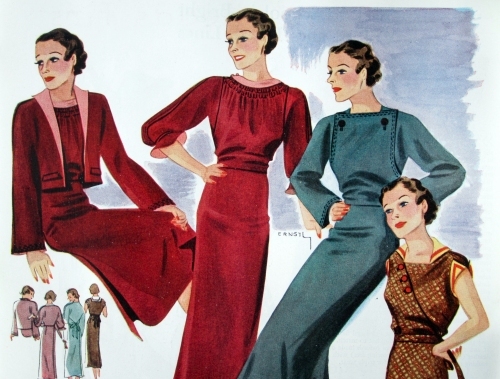 Perhaps the words “self-adjusted waistline” were a code that women understood in the thirties? 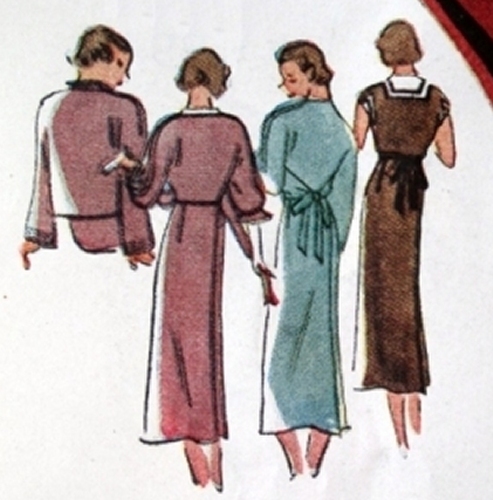 I’ve been looking online at other maternity patterns from the forties; they look like ordinary fashions in the illustrations on the fronts. Pregnancy was discussed in hushed voices until the late 1940s – 1950s, as far as I know. The I Love Lucy show made history in 1952 by showing a pregnant actress playing a pregnant character, but she was “Enceinte” in the episode title and “expecting” — the word “pregnant” was forbidden by the network. 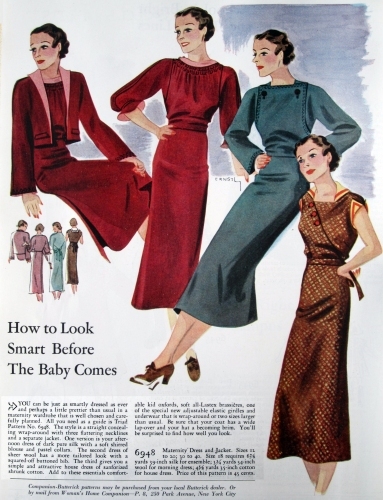 Strangely another Butterick pattern from around 1937, Butterick 7568 (http://vintagepatterns.wikia.com/wiki/Butterick_7568_A) was more explicite stating “With self adjusted waist-line for maternity use”. Thank you for the link to that pattern. I hope eventually to find out when pattern makers stopped putting the extra fullness in the back, so the dress could be worn after pregnancy, and started putting it in the front where it was needed. There was such social pressure to conceal pregnancy — at least till the 1940s…. So interesting that the pattern envelope does not say the dress is designed as maternity wear. No, I’d have not guessed these were maternity dresses. I’d love to see the pattern pieces to see just how that skirt pleat or wrap operates.